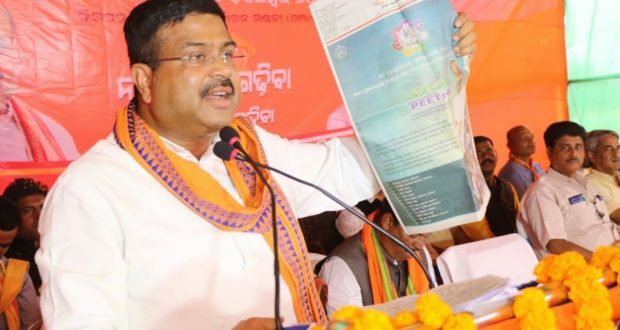 Bhubaneswar:16/12/18: Union minister Dharamendra Pradhan said that” Chief Minister Naveen Patnaik has done scant little for non-resident Odias in the last 19 years of his government being in power. He did not spare time to visit Surat during these years. Shri Patnaik should try to understand Prime Minister Narendra Modi’s Gujarat Model of development during his visit. Chief Minister Naveen Patnaik’s letter to two Union Ministers, Shri Piyush Goyal and Shri Suresh Prabhakar Prabhu, and the Gujarat Chief Minister Shri Vijay Rupani ahead of his Surat visit amply reflects that he has no concern for Odias living outside the State—he has never met Odia communities living in New Delhi, Chennai or other parts of the country either. It is shedding crocodile tears for people ahead of elections.”If Chief Minister is so concerned for Odias in Surat, I request him to take a policy decision to implement Ayushman Bharat for the larger interest of the people before leaving for Surat. Around 12 lakh people from Chief Minister’s home district Ganjam are earning their livelihood in Surat. If the scheme is implemented, Odias working in Mumbai, Delhi and Bangalore will benefit immensely from the central scheme. People of Odisha are known for their hard work and play a crucial role in the economic development of the states they are living in. They are now questioning their 19-year-old government for its failure in generating employment opportunities for the youth in Odisha. I ask this question: why is the Chief Minister not cooperating in making Odisha a hub of petrochemical hub if he is, indeed, serious about the development of the State. Odisha youths are migrating after failing to get gainful employment in Odisha. I urge the Chief Minister to adopt the Gujarat Model of development adopted by Prime Minister Narendra Modi during his CM stint. Chief Minister Patnaik has not done nothing for the employment of youth in his home district of Ganjam. I request him to understand the sentiments of people who are moving to neighbouring states in distress for the lack of work.